Mom and all the girls were gone unexpectedly for hours this afternoon. 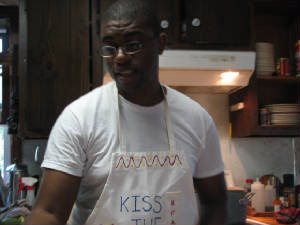 They came home to a welcoming surprise: Tsheko (complete with our KISS THE COOK apron on!) with two little helpers, had made one of the best dinners ever! He had never let us know of his incredible culinary skills before tonight. We have already him signed up for tomorrow's dinner!